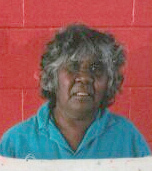 Dolly Mills Petyarre was born at Boundary Bore Outstation and her language group is Anmatyerre. She is widely recognised as one of Australias leading Aboriginal artists and has work in major Australian and international collections. The delicate patterning and subtle colours of Dolly’s work depicts her country of Alhalkere situated in the Utopia region north east of Alice Springs. She participated in the Utopia, A Picture Story which included 88 silk batiks from Robert Holmes a Court collection. This confirmed the artistic credibility of the Utopian artists. The major subject of her work is in association with Yam Dreamings and Wild Tobacco. Collections & Exhibitions: 23 September 2003 - Australia’s leading Indigenous Artist Dolly Mills Petyarre took centre stage at Walkabout Art’s latest exhibtion "Hello Dolly"